Mason Robertson (right) scored the only goal. Mason Robertson’s goal gave Peterhead a 1-0 win over Stirling Albion in the first leg of their League 2 play-off semi-final. The defender turned home Russell McLean’s flick-on after half-an-hour for the game’s only goal, in a game where the Blue Toon should have won by a greater margin. The form of Stirling goalkeeper Cameron Binnie kept the score down, as he made great stops to deny McLean and Rory McAllister and keep Dave Mackay’s side in the contest. 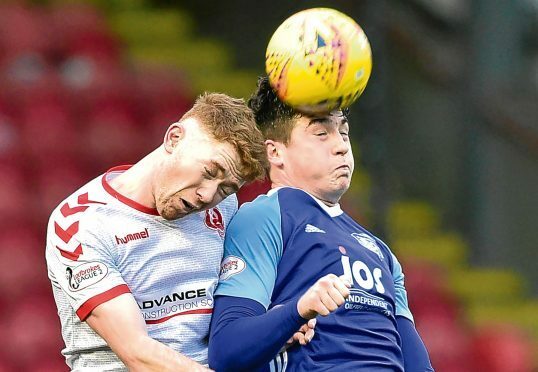 But Jim McInally will fancy his team’s chances of putting the tie to bed at Balmoor on Saturday, with the prize either Queen’s Park or Stenhousemuir in the final next week. The first chance came for Peterhead nine minutes in as McLean took Jamie Stevenson’s pass and Binnie to block with his feet. Binnie produced a remarkable stop less than 60 seconds later as he flung up a left hand to tip McAllister’s shot on to the crossbar. The siege finally broke through the home resistance on the half-hour mark, as Jack Leitch’s diagonal ball was nodded back across goal by McLean into the path of Robertson, who turned in on the slide from six yards. The hosts could not have been more shot-shy after the first half and set about rectifying that. With 53 minutes on the clock Danny Jardine watched on as his snap-shot rolled agonisingly wide of the far post. Robertson was denied a second on the hour after Binnie flapped at Gibson’s corner, with ex-Falkirk and Hearts defender Darren Barr back-pedalling to clear the header off the line. They were fortunate to see Leitch’s deflection, off Ross Kavanagh’s low cross, roll out of harm’s way with 10 minutes to go and he lashed wide at the other end when presented with a chance. However it mattered little, as Peterhead did enough for a first-leg advantage.